I’ve been telling you some of our dementia stories – Lena’s and mine. But you only ever hear one voice. Mine. The caregiver’s. Not the person who actually has dementia. Sadly, Lena lost her fluency of expression a long time back. That’s not to say she doesn’t have feelings and emotions – I see them in every movement of her face, every gesture. It’s just that she can’t arrange the words any more. So what’s going on inside her head?Fortunately not everyone’s affected in the same way as Lena, and there are some who, despite the illness, are extraordinary story-tellers. Let me introduce you to one of them. 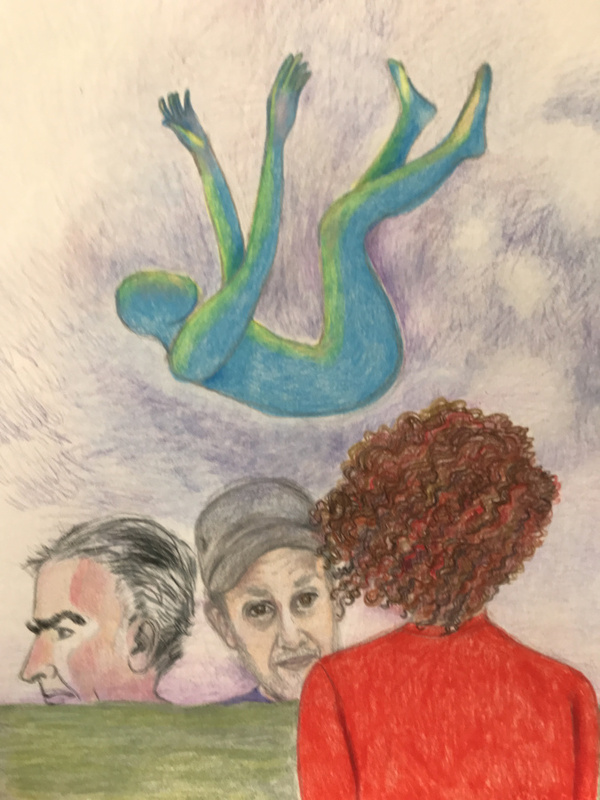 Free Fall - a drawing by Minna Packer - from her website, Suddenly Mad. Minna has been an educator, filmmaker, producer/director, fine artist and writer. Born in 1954 in New York City, she is a first generation American, born to Jewish Holocaust survivors from Eastern Europe. She was diagnosed with Early-Onset Alzheimer’s in 2017 and logs the innermost thoughts and experiences of her new world at Suddenly Mad. Minna’s not looking for our sympathy. She wants empathy – for us to be able to see the world through her eyes, to feel it as she feels it. She desperately wants to continue connecting. If she’s connected with you, I urge you to tell her that on her site, Suddenly Mad, by leaving a comment or signing up to her newsletter. Don’t warehouse us with untrained workers who are overwhelmed with caring for dozens of dementia patients. Find another way. Find another way. That’s exactly what we want to do at The Care Combine, delaying or even preventing the move to residential care for those with dementia. But is The Bine the solution that Minna is looking for? What else will she suggest? Your input We'll be featuring Minna and other writers with dementia whose stories we love in a new section of The Care Combine blog, called Voices. If you know a story-teller who can take us right into the world of dementia, please let us know.